Every year when I am deciding what to bake for Christmas, I always know that a shortbread cookie will be on my list. This recipe for Scottish Shortbreads makes a very fine Christmas cookie with its rich buttery flavor and tender yet crumbly texture. As its' name implies, this cookie is Scottish in origin and is made with just four ingredients, butter, sugar, rice flour (or corn flour/cornstarch), and flour. While shortbreads can be made in various shapes and sizes, we will stick with tradition here and bake them in a round shape and then cut the round into wedges, called "petticoat tails". The name "petticoat tails" refers to the shape of the shortbread wedges which look like the bell-hoop petticoats worn by court ladies in the 12th century. The secret to making a good Scottish Shortbread is to have a light hand when mixing the ingredients and to use the finest ingredients. So that means a high quality salted butter. Now, butter in the States is graded according to flavor, color, texture, aroma and body and one easy way to tell the quality of the butter is by the letter code or numerical number listed on the butter's package. The highest grade is AA (93 score), then A (92 score), followed by B (90 score). Also, these shortbreads contain rice flour which gives the shortbread a more crumbly and tender texture. Rice flour is a fine gluten-free flour produced from white or brown rice. It can be found in some grocery stores or else health food stores. In the absence of rice flour you can use cornstarch (corn flour) which is a fine white powder that comes from the inner grain (endosperm) of corn. Scottish Shortbreads are made by hand using just one large bowl. An electric mixer is not needed. To make the shortbreads, first mix the flour with the rice flour and sugar. Next, very cold butter (preferably frozen) is grated over the flour mixture. Then, with your fingertips, take small handfuls of the mixture and gently rub the butter into the flour. Keep lifting and rubbing the butter and flour together until the mixture looks like breadcrumbs (you do not want a dough to form). Take the shortbread and place it in an eight inch tart pan with a removable bottom. Press into an even layer and prick the surface with the tines of a fork. The final step is to take a sharp knife and 'score' the top of the shortbread into 16 wedges. ('Score' means to lightly mark or make shallow cuts into the top surface of the shortbread with a sharp knife or prongs of a fork. Do not cut all the way through the pastry or bread. Scoring is done both for decorative purposes and as a way for gases to escape during baking.) Bake in a 300 degree F (150 degrees C) for about 40-50 minutes or until biscuit colored. Remove from oven, place on a wire rack to cool for five minutes before removing from tart pan. 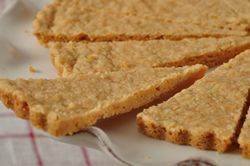 Place the shortbread round on a cutting board and cut each shortbread round into 16 wedges (along the lines scored). Cool completely on a wire rack. Scottish Shortbreads: Preheat oven to 300 degrees F (150 degrees C) with the rack in the middle of the oven. Have ready an 8 inch (20 cm) tart pan with a removable bottom. In a large bowl whisk the flour with the rice flour (or corn flour/cornstarch) and the sugar. Then take the very cold butter and grate it over the flour mixture. With your fingertips, work the butter into the flour by lifting small handfuls and rubbing the butter and flour together until the mixture looks like breadcrumbs (you do not want a dough to form). Evenly press the shortbread into the tart pan, smoothing the top as best as you can. Prick the surface with the tines of a fork and then, with a sharp knife, score the top of the shortbread into 16 wedges. Bake for about 40 - 50 minutes (watch carefully) or just until a light biscuit color. Remove from oven and place on a wire rack to cool for about 5 minutes. Then remove from tart pan. Place the shortbread round on a cutting board and cut each shortbread round into 16 wedges (along the lines scored). Cool completely on a wire rack. MacDonald, Claire. Sweet Things. Century Publishing. London: 1984. McNeill, F. Marian. Recipes from Scotland. The Albyn Press. Edinburgh: 1946. McNeill, F. Marian. The Scots Kitchen. Mercat Press. Edinburgh: 1929. Note: Can use 1/2 cup unsalted butter and 1/4 teaspoon salt.